The Ingalls Family. 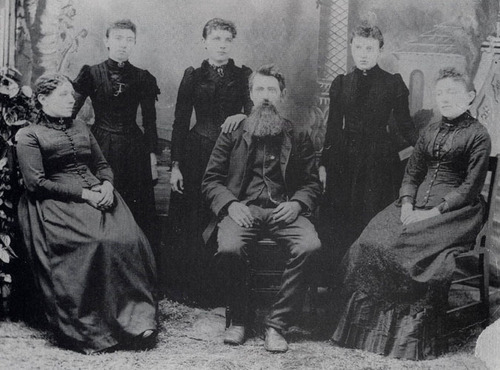 Seated from left: Ma (Caroline), Pa (Charles), Mary Standing from left: Carrie, Laura, Grace. Wallpaper and background images in the Laura Ingalls Wilder club tagged: laura ingalls wilder family carrie laura mary charles caroline grace. This Laura Ingalls Wilder photo might contain béret vert, forces spéciales, soldat d'élite, soldat d’élite, tenue de combat, joint de marine, le joint, joint d'étanchéité de marine, navy seal, and seal. Were pioneer people depressed? Or is it just the picture? @pugfan, well, life was tough, but I think the main reason was how long it took getting the picture taken,lol. Looking overly 'cheery' was also not appropriate for adults back then, this had alot to do with their beliefs.